In North Carolina, state law effectively prohibits local communities from collaborating with neighbors or partnering to offer gigabit connectivity to residents, businesses, or anchor institutions. As a result, rural communities are unable to keep pace with the 21st century. 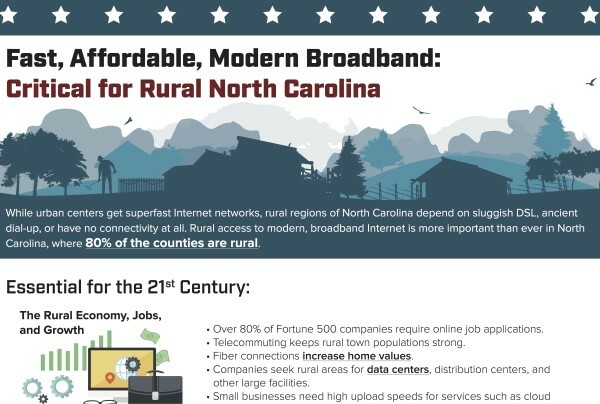 The Coalition for Local Internet Choice North Carolina chapter (CLIC-NC) and the Institute for Local Self-Reliance (ILSR) have teamed up to create a fact sheet: Fast, Affordable, Modern Broadband: Critical for Rural North Carolina. This fact sheet emphasizes the deepening divide between urban and rural connectivity. The fact sheet can help you explain why people who live in the country need services better than DSL or dial-up. This tool helps visualize the bleak situation in rural North Carolina and offers links to resources. Rural North Carolina is one of the most beautiful places in the country but also one of the most poorly served by big Internet access providers. The gap between urban and rural connectivity is growing wider as large corporate providers choose to concentrate their investments on a small number of urban areas, even though 80 percent of North Carolina’s counties are rural. To add insult to injury, North Carolina is one of the remaining states with barriers on the books that effectively prohibit local communities from making their own choices about fiber infrastructure investment. CLIC-NC and ILSR want you to use this tool to help others learn how crucial it is to let local communities chart their own fate through local authority. Download the fact sheet and pass it on.